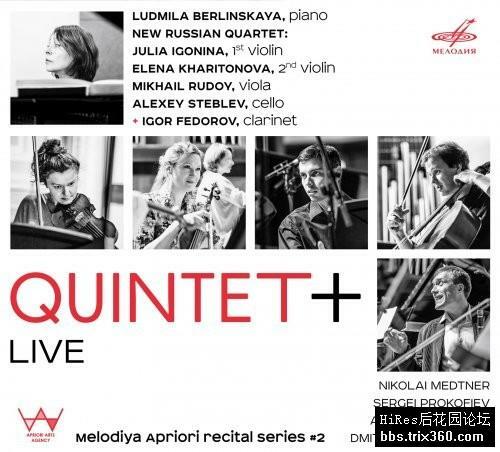 Melodiya presents the album Quintet+ as part of the Melodiya Apriori project. This recording is a live broadcast of one of four concerts that took place at the Small Hall of the Moscow Conservatory. This album features Ludmila Berlinskaya, a pianist, teacher and representative of the glorious music dynasty, performing with the New Russian Quartet, a string ensemble formed in 2008 that has won the recognition of domestic and international audiences. The recording also features Igor Fedorov, one Russias finest clarinettists. Two large-scale works are the bedrock of the programme piano quintets by Nikolai Medtner and Dmitri Shostakovich. For Medtner, who left the revolutionary Russia and lived in need for many years, the quintet was his last piece he finished it in 1948 although he had nurtured the idea for more than 20 years. Dmitri Shostakovich finished his quintet before the Great Patriotic War. Technically speaking, this is one of the masters 'classical' pieces, notable for its vivid imagery, depth and transparency of sound. The album also includes two pieces for piano and strings with clarinet. These are Sergei Prokofievs Overture on Hebrew Themes (1919) and the Sextet by contemporary Moscow composer Alexei Kurbatov. The latter admitted that he imagined a train that was moving away into the distance, as a symbol of the ever running life that we try to catch up with. Piano Quintet In C Major, Op. Posth.